One of the most well kept secrets in the Charlotte area is the existence of the Old Courthouse Theatre and their Living Room Reading Series, which I have covered here before, with much pleasure. 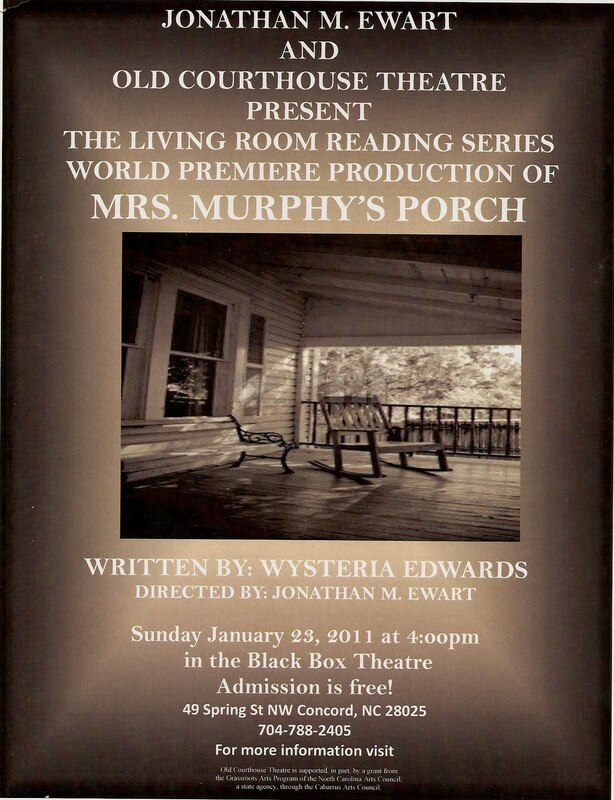 Yesterday's World Premiere performance of Wysteria Edwards exceptionally well written new play, "Mrs. Murphy's Porch", was equally well performed by the cast. If you have never been to a "reading", then you have no idea what you are missing. The actors sit, or stand, in front of the audience, scripts in hand, and read the play without the benefit of scenery or costumes. This is the true test of any play. Does it have the clarity, and the power, to deliver the author's message standing soley upon their written words? In Ms. Edwards case, and with the help of Director Jonathan Ewart and his band of performers, the answer is a resounding yes. The play opens in a classroom on January 28, 1986. This was the day the space shuttle Challenger exploded shortly after blasting off from Kennedy Space Center in Florida, killing all aboard. The opening of this play co-incides with that moment. The story centers around Penny, a young girl, played with great empathy by Melissa Bowden, and her friend Henry, played by Jake Sumner. The two are largely inseperable and play all kinds of fantasy games. Penny is always in charge, while Henry follows her lead. When they play at Peter Pan, Penny is Peter Pan while Henry is relagated to the role of Tinkerbell. Penny is controlling, while Henry is almost docile. Penny's home sits next door to Mrs. Murphy, a local spinster,played wonderfully and with great tenderness by Margaret Lackey, who sometimes joins in the childrens fantasies and games. She is also the sympathetic ear for the children and Penny's parents, Jim, played by Jeremy Peterson, and Elaine, played by Claudia Reiff. As parents, they are very different from one another. Elaine sems almost obsessed with Penny's living in a constant fantasy world, while Jim feels that she is just going through a phase. He even participates in some of her fantasy games. When Henry goes to visit relatives in Myrtle Beach for a few weeks, Penny is devastated. Her world begins to crumble. Without the fantasy based friendship of Henry, Penny has no place to look, except to her real life. By this time, the audience has been introduced to the town physician, Dr. Hamilton, played with great charm by Gene Saine, as a wise, but lonely man. When Henry returns from Myrtle beach, things have changed a bit between him and Penny. He seems reluctant to play the subservient role. At this point Dr. Hamilton has revealed the big secret which is the driving force behind Penny's controlling behavior. In a heart wrenching scene Penny visits her younger sister, Amy, played by Elaine's real life daughter, Olivia Reiff, in the hospital where she is dying from lukemia. The two girls share their views of life and the pure chance that governs all of our fates. It is at this point in which the audience realizes that Henry has been penny's surrogate sister all along. That point is made all the more poignant when it is revealed to the audience that Penny's sister is her twin. Interspersed, as it is, with references to the Challenger disaster, the children, as well as the adults, are all forced to examine the random nature of the events that sometimes overtake us. Only Mrs. Murphy, a woman who has been widowed, seems to understand the full nature of this thing we call life. Doctor Hamilton seems to understand this as well, and the two are drawn to one another as the play comes to a close. The central message that I took away from this beautifully written play is that we are all victims of life, and all that it brings us, for better or worse. All we can do sometimes, as human beings, is to accept those things, store them for reference and then move on. This was yet another triumph for Concord's Old Courthouse Theater and the Living Room Reading Series. The performers were all superb, Melissa Bowden was excellent as the lead character of Penny, who narrates portions of the play as a grown up, looking back upon the events in the play. Thanks, Jonathan Ewart, for another wondeful and enjoyable presentation.